Last fall we put our house on the market. It didn't sell. A tornado went through the town we were wanting to move to, changing the market there but it didn't matter because our house didn't sell. We found a house that we loved and we made an offer, which was accepted, but our house still didn't sell. We lowered the price on our home, and it still didn't sell. So we lowered the price again. Shortly before Christmas, with our contingency offer expired, we took our house off the market so we could enjoy the holidays without the stress of showings. There were a lot of people, Catholic and non-Catholic alike, who asked if we were going to bury a statue of St. Joseph in our yard. This spring we put our house back on the market. Finally, we had lots of showing, lots of interest, and then one day we had two couples look at it. They both loved it and wanted it. We asked them both for their best offer by noon the next day. In the end we accepted an offer of a newlywed couple for more than our listed price. Meanwhile, we learned that the house we had wanted in the fall was now "Sale Pending". We quickly had to find a house that was within our budget, not a dump, in a good neighborhood, and big enough to hold a family of seven. We were really nervous. As we looked online we saw a home that fit most of our requirements: in a good neighborhood, three bedrooms, lots of space, a nice yard, well cared for though outdated so Travis could put some sweat equity into it. Amazingly, the home was safe from any major damage in the November tornado though most of the homes around it were ruined. It seemed perfect for us, except that it was listed out of our price range. Long story short, we bought it "as is" for a lot less than what it was listed as. This perfect little house is ours, and we will move there in less than two weeks. There's three things we did in our hope to sell our home. 1 - We trusted in God's goodness, not superstitions. Burying a statue of St. Joseph because it's supposed to make your house sell is nothing but a superstitious act. As Christians we don't believe in superstitions - we believe in God. Of course there are people who have done this tradition in a faithful and not-at-all superstitious way. Personally I still don't like it, but that is a personal preference and we can disagree. If you have done this as a part of a prayerful practice then I'm not talking about you. I know that Catholic stores sell Home Selling St. Joseph kits. I know that there are even nuns who make and sell these kits. But it is also quite common, especially in certain parts of the country, for realtors to pass out chintzy St. Joseph statues to every client with directions to "Bury him and you're house will sell!" It is one thing to place St. Joseph on a piece of land or a home you wish to buy, to use St. Joseph to claim the land, and to put it under his patronage. It is another thing all together to bury his likeness in the ground because doing so is supposed to give you the results you want. 2 - We placed the intention in Mary's capable hands. When our home went on the market for the first time I was preparing to do a consecration to Mary using the book 33 Days to Morning Glory. During that time I entrusted Mary with my hopes that our home would sell to a nice family who loves God, and that we would find the perfect home for us to raise our kids in - a place we could all be happy for a long time. I asked her to pray for me, to talk to her Son about my intentions When I would become frustrated I would tell her, "I have no more wine!" which was my code word for: Fix this, please! When I would start to doubt (in her prayers, in God's faithfulness, whether we would ever move) I would ask her to untie the knots in my life. With her on my side I never doubted for long. 3 - We placed an image of St. Joseph in a place of honor in our home. To most people it would have looked like just another Catholic decoration, but every time I passed that image of St. Joseph I would ask him to find someone to buy our house. I spent a lot of time thinking about how St. Joseph had to find so many homes and shelters for Mary and Jesus, from the stable in Bethlehem to Egypt to Nazareth. I know he's good at finding homes and so I asked him to also help us find a perfect home for our family. In the end, God is our loving Father and He wants what's best for us. It is good to remember that and to trust in His timing and His perfect ways. YES! I'm always surprised when I hear people ask about burying St. Joseph! Glad you wrote this! I disagree that burying a statue of St. Joseph is always a superstitious activity (and for the record I've never actually done that). I think if it is done without prayer than it is just a superstitition. However if it is done with prayer, I think it is just a tradition...a way of reminding people to ask St. Joseph for his intersession and care in the selling of a home. don't think the tradition of burying a statue is necessarily disrespectful or superstitious...it can be, but it isn't always. And honestly, I sometimes prayer can be superstitious (like when you see those "never-fail novenas")..it depends on the intent of the person praying and if they have a superstitious mindset or not. You are right to point out that the practice can be a tradition done prayerfully by the faithful and I should have done that in the post. In fact, I think I'll add that in. But just because a person says some words on a prayer card doesn't mean the act gets bumped up to appropriate. Those are just the "magic words" for many people. 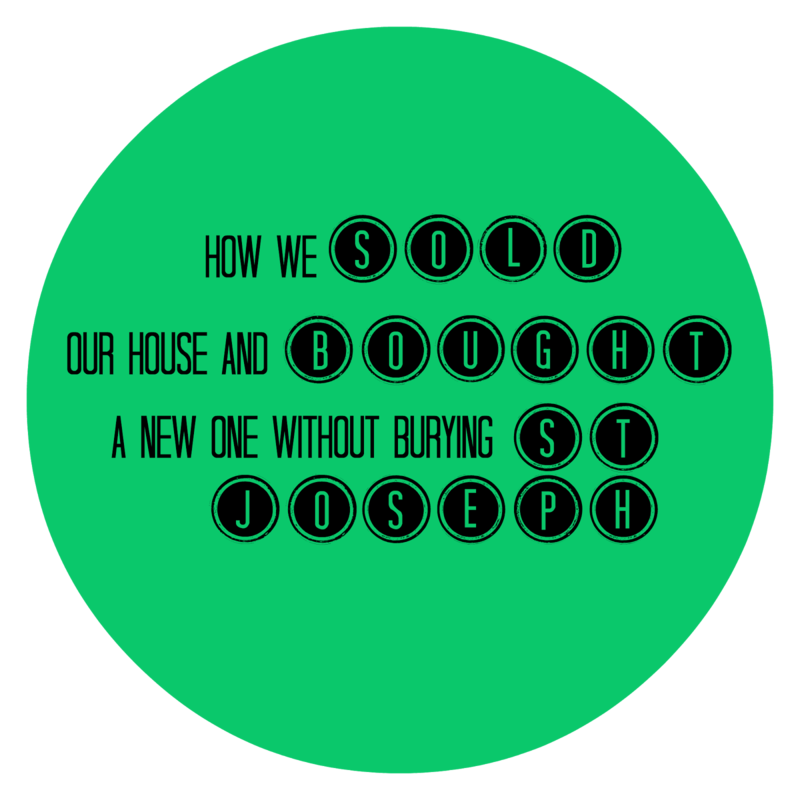 I still think there are much better ways to include St. Joseph in the selling of our homes and this post was a means to encourage Catholics to rethink the cultural practice of burying St. Joseph because when we tell everyone to "bury St. Joseph in your yard - that worked for me!" we may very well be spreading the superstition and not doing something that honors Jesus' foster father and brings glory to God. We were given two to bury and I just never bring myself to do it or I totally forget and now I don't feel so crazy for it. St Jo's statue is on the kitchen windowsill above our sink and it's my reminder to ask his intercession and trust God, as you mentioned in your post. Thanks for this! This is such a great reflection - and what hit me the most is how perfectly God works things out, and how clearly you can see that in retrospect. We also just sold our house (also without a superstitious St. Joseph burial) and despite remembering how well everything worked out in buying this house (including losing bids on 2 others...) I still find myself incredibly stressed about our future housing arrangements. If only I were better at remembering God's kindness to us and trusting that He will do the same in the future! I appreciate this post and would like to hear your further thoughts. For example, to many Protestant ears, the Memorare prayer sounds superstitious, or the wearing of scapulars to avoid eternal fire, or saying the Divine Mercy chaplet for those who are about to die, etc. Also, how do you respond to people who say that ritual IS superstition? I hear that a lot…of course, usually from people who would be offended to hear me compare their refrains of "Jesus I juswannathankyou for…Lord I juswannathankyou…Lord we justhankyou so much Lord…FatherGod I juswannapraise you," etc. That's different from repeating the Our Father because, well, it's from the heart. You can tell because it has the phrase "I just want to" in it. I'm being facetious but I really do want to hear more about how you would help a person to discern the difference between doing a good practice idolatrously/superstitiously and a practice that is just plain idolatrous. Is this making sense? Sorry, I'm rambling, and my two year old is poking me in the eyes. Jenny, I have definitely known Catholics who have worn the scapular in a superstitious way! I think a lot and perhaps all things religious (Catholic or no-Catholic alike) can easily become just a superstitious act instead of a prayerful one. That said, I think the attitude that surrounds an event is very important - thus someone praying the Divine Mercy chaplet at another's death bed would be very different from a cafeteria Catholic burying St. Joseph upside down because it's supposed to sell his house real quick. The intention, the attitude, the purpose of those two things are very different. But no way is ritual superstition. I mean, it's a family ritual that every 3rd Thursday of November we gather with family and eat turkey. It's a ritual but definitely not a superstitious one. Some things are traditions, some things are wholesome aids, some things are healthy habits. Not sure if that helps or not. I'm pretty sure my toddler is dumping chips on the kitchen floor. What is it with toddlers being toddlers and not letting mommies blogchat? ;) Yes, thanks for clarifying. I'm about to make a visit to my family, some members of which are pretty unhappy that I'm thinking seriously about becoming Catholic, so I like to arm myself with reasons why it's not all "crazy ritual" whatnot. I think you're right about ritual not being superstition (although I think Thanksgiving is the 4th Thursday) and I definitely agree that the intention of your heart is what matters. Several times in the OT God says he despises sacrifices made without the accompanying contrition, so I think that supports what you're saying. Thanks for adding on to your original (and already great) post for me! I am so glad to hear someone say this. I've always wanted to rant on the subject but never had the courage. I think it's exactly like the novenas never known to fail. People see prayer all wrong--it's not the divine shopping line, it didn't "fail" if you didn't get what you asked for. Every prayer is always answered, just not always the way you wanted. Thanks for this post. We Protestants have our own weird rituals too and our own "God as cosmic vending machine" moments. Thank you, thank you. Some people try to teach others about this practice as if it were a really important faith matter. Your post is excellent, and you continued the excellence in your comments. "just because a person says some words on a prayer card doesn't mean the act gets bumped up to appropriate." Huge amen to that! This is great, Bonnie. Lots to think about. I've never been a fan of the burying St. Joseph thing because it also strikes me as superstitious. I also struggle with novenas, especially to St. Therese, because of the whole looking for a sign thing. I believe that some people (myself included once!) receive specific signs from God via Saintly intercessors through prayers, rituals, and novenas, but I can't help but feel superstitious when asking for something specifically - a certain outcome, say, or a certain colored rose. So I don't. But then I struggle when I do have a very specific prayer intention. Some folks have such a childlike faith in the Lord and really fly to Him and trust that He'll take care of every little thing. I, on the other hand, feel like it's overstepping and being pushy with God if I demand specific things in prayer. Who am I to demand things of the Lord? Furthermore, He's shown time and time again that His plan is greater and better than mine. What do you think (if you can discern any coherent thoughts in that messy ramble)? You know, the St. Therese ones bother me too because people will be like, "I did the Therese novena and then on the 9th day I went to the grocery store and there were all these ROSES!" and I'm like, "Yeah, because you were at the grocery store, that has a a florist section." You know, I pray for very specific things. When James was in the NICU I prayed that he would pee a specific amount of fluid ounces so he met the goal of his doctor! But I don't ask for specific signs and such. I also pray that God will make things clear - close doors, open doors, give me peace, help me make a decision, etc. I don't demand, and I'm sure you're not demanding either, but there's nothing wrong with asking. Does this help at all?! I completely agree! My husband calls this religisticious. It's his word but it describes a lot of those catholic things people do that have lost their prayerful meaning. Hilariously, my Jewish grandmother truly and fully believes in burying St. Joseph statues to sell a house. She recommends it to all her Jewish friends. You're viewpoint on St. Joseph Statue being a superstition is news to me. I even went on Fisheater's (which I think is pretty careful about this type of stuff) and they seemed to say prayerful burial is fine. They site my bff of Teresa of Avila and my buddy Blessed Brother Andre. I'm selling my house and I've got a buried St. Joseph statue in my front yard. I didn't pick up a kit. I took my beloved kid friendly plastic piece of from my favorite Nativity, and prayed with my entire family, and buried him together. He's well marked, because he will be unburied, washed well, and taken with us when we move. I love St. Joseph. He's my friend. I feel like being painfully parted from a favorite statute was a good reminder that I need to be detached in this stressful, scary process. St. Paul tells us to act like 'we are NOT buying and selling land." Tangibly putting my buddy St. Joesph in my front yard helped me trust that God's got us in his hands. I can turn this over and try to live as normal and happy life during this time of transition. I'm not trying to be argumentative. Just sharing my perspective as a fellow prayerful Mom who is in the scary process of looking for a new house while raising lots of small children. Just to be clear, I did say that burying things is not allowed - oftentimes it is the reverent way to dispose to things and of course there's a lot of different reasons why burying something would be okay. It is the act of burying St. Joseph because doing that will sell your house - that attitude - that I don't like. If I do X, I'll get Y. It's just not true. Knowing you, I am sure that you did it prayerfully and devoutly. and I don't judge you. I still dislike the practice but we can agree to disagree. Also, I know there have been saints who have buried medals, etc. My husband and I prefer how St. Max Kolbe did it. He wanted some land owned by a wealthy athiest so he put a statue of Mary in the middle of it and prayed and prayed, and asked the man repeatedly. Finally, instead of selling it to St. Max, the man gave it to him for free. We like this because so much of our faith is outward signs - the sign of the cross, hanging crucifixes, ashes on our foreheads, professing our faith at Mass... burying something is hiding it away. Mary in the middle of the land wasn't hidden - she was there for anyone to see. Does that make sense? When I originally read this post, I finished up and thought, "Wow. I never thought of it that way." I have never buried a St. Joseph statue to help me sell a house, but I have had some people suggest it to me for when we get ready to sell our house next year. I hadn't thought much about it and whether it was appropriate/superstitious or not. I really did think about it after reading your post though, and I certainly see your point. Coming back to read the comments after seeing your quick takes post has been wonderful. I love when posts spark such thoughtful comments. I am so new to prayer and religion in general and Catholicism in particular that I sometimes feel like I'm not doing prayer right or that I'm asking for too much or doing something that is superstitious even though I don't really mean to. When I first started praying, I definitely was going overboard into the superstitious, magic novenas and chaplets and so on, but then I realized that I needed to just focus more on God and His will. I'm not sure if I get it right much of the time still, but I think my intentions are in the right place at least, so that's something. Thanks for saying this, as someone checking out the Catholic Church, I found it hard to reconcile this.